BACKGROUND AND PURPOSE: Patients who have had a colloid cyst removed from the third ventricle sometimes experience some difficulty with day-to-day memory. This study provided quantitative MR imaging volume measures of 1 structure potentially responsible for mnemonic problems, the mammillary bodies. Additional volume estimates in structures connected to the mammillary bodies sought to determine the specificity of any atrophy. MATERIALS AND METHODS: Volume estimates of the mammillary bodies were performed on 38 patients after surgical removal of colloid cysts and 20 control subjects by the application of stereologic volume-estimation techniques. 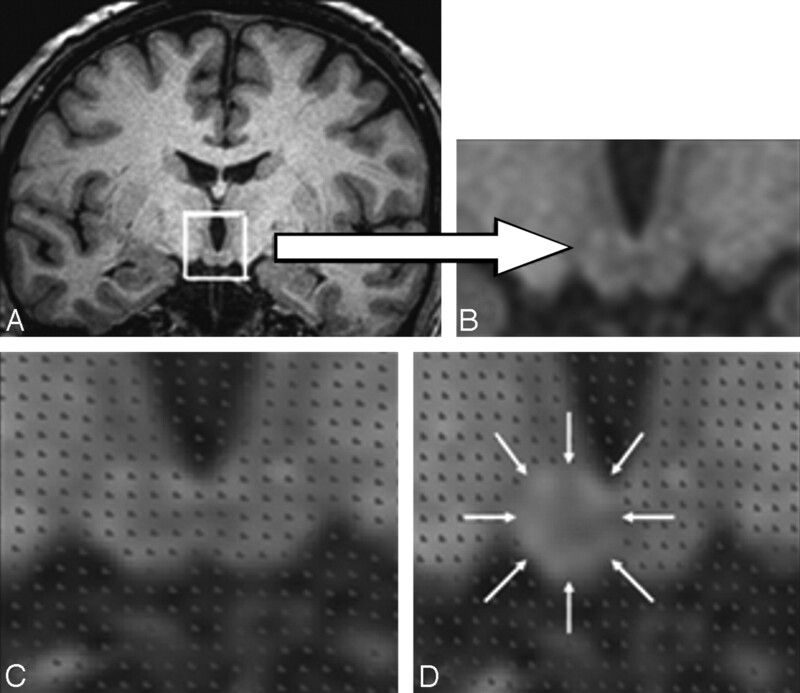 For the mammillary body measures, 2 groups of MR images were assessed (0.8- and 1.0-mm section thickness) to compare the sensitivity of each imaging sequence for detecting any atrophy. Other structures associated with memory processes, such as the hippocampus and fornix, were also assessed quantitatively to determine whether there was a correlation between mammillary body damage and atrophy in connecting structures. RESULTS: Our investigations established the superiority of 0.8-mm-volume scans over standard isotropic 1.0-mm-thick-volume scans for mammillary body assessments. Comparisons with 20 age-matched controls revealed that patients with colloid cysts frequently showed significant mammillary body atrophy (mean volume of colloid cysts, 0.037 cm3 right and 0.038 cm3 left; control subjects, 0.069 cm3 right and 0.067 cm3 left). In fact, every patient had a mammillary body volume below the control mean, and the majority of patients had a volume decrease of >1 SD (82% right, 74% left). Mammillary body volumes correlated with fornix volumes in the same patient group. CONCLUSIONS: Our results reveal the frequent presence of mammillary body atrophy in patients with surgical removal of colloid cysts and indicate that this atrophy is partly due to a loss of temporal lobe projections in the fornix. The mammillary bodies form a vital link in a putative memory system comprising the projections from the hippocampus to the mammillary bodies and thence to the anterior thalamic nuclei.1–3 Unfortunately, neuropathologic evidence concerning mammillary body function has often been difficult to interpret because it typically occurs in conditions in which additional pathology is present in other sites. Examples are the amnesic Korsakoff syndrome and tumors in the posterior hypothalamic region.4–12 Consequently, there remains much uncertainty about the importance of the mammillary bodies for memory.13 Additional interest in the integrity of the mammillary bodies arises from evidence that in schizophrenia, there are cellular and volume changes in this structure.14,15 The principal goal of the present study was, therefore, to determine the extent of mammillary body shrinkage in a condition often associated with memory loss, colloid cysts of the third ventricle.16,17 Although some previous descriptions of this condition have noted mammillary body shrinkage,18–20 to our knowledge, there are no quantitative reports on the extent and frequency of mammillary body change. These 2 aims led to the need to develop an MR imaging sequence that would improve the reliability of volume estimates for the mammillary bodies—a second subsidiary goal. We, therefore, developed an 0.8-mm-thick-section scan for the measurement of these small structures, which we compared with the standard 1-mm-volume scans. This was a challenge because the mammillary bodies are positioned at the base of the brain and are small, with an estimated volume of approximately 50 mm.3,26,27 Unlike previous MR imaging studies of the mammillary bodies,28,29 the volume estimates were based on stereology, which uses a randomly generated start section and randomly generated grids for the measurement procedure, therefore ensuring that the volume estimates were unbiased, (ie, sections and grids were not chosen by the observer) and ensuring predictable precision. Volumetric MR imaging was performed on 38 patients who had undergone surgical removal of a colloid cyst located in the third ventricle of the brain (18 men, 20 women; average age, 47.4 years; range, 22–71 years). The patients were drawn from 14 neurologic centers across England, Scotland, and Wales. A variety of surgical approaches had been used to visualize and access the cyst before its removal (transfrontal, n = 4; transcallosal, n = 13; endoscopic aspiration and excision, n = 21). Patients were excluded from the study if they had additional neurologic disorders or MR imaging−noncompatible shunts (eg, magnetic or programmable shunts) or were younger than 18 years of age. These exclusion criteria included known alcoholism and Korsakoff disease, both of which are likely to affect mammillary body volume. In addition, 4 patients included in the study had nonmagnetic shunts present. No patients had to be removed from the study due to known surgical complications. The interval between the colloid cyst surgery and subsequent MR imaging ranged from 12 to 240 months (mean, 79.9 months; SD, 66.7 months). Of the initial 71 patients identified from hospital records, 38 agreed to be scanned. The remaining 33 patients did not respond to written requests for participation in the study. With the exception of 1 patient who developed epilepsy before scanning, all other patients were thought to be free from other neurologic or psychiatric disorders. Comparisons were made with 20 age-matched control subjects (10 men, 10 women; average age, 48.1 years; range, 25–62 years). All participants gave fully informed written consent to the study, which had UK Multi-Centre Research Ethics Committee ethics approval in accordance with the Declaration of Helsinki 1964. All MR images of the brain were acquired by using the same 3T Magnetom Trio whole-body imaging system (Siemens Medical Solutions, Erlangen, Germany). A block of 72 contiguous coronal T1-weighted image sections of 0.8-mm thickness were obtained by using a 3D thin-section magnetization-prepared rapid acquisition of gradient echo (MPRAGE) pulse sequence (TR, 2040 ms; TE, 5.57 ms; TI, 1100 ms; flip angle [FA], 8°; acquisition time, 11 minutes 47 seconds). The FOV of the images was 256 × 256 mm. Section prescription was performed coronally along the length of the fornix. In addition, an isotropic MPRAGE volume scan (TR, 1960 ms; TE, 4.43 ms; TI, 1100 ms; FA, 8°; acquisition time, 8 minutes 23 seconds) was acquired providing 172 contiguous coronal sections having a section thickness of 1.0 mm, which was used for the measurement of the temporal lobe structures, prefrontal cortices, and whole hemispheres. It was anticipated that the MPRAGE volume scans having 0.8-mm-thick sections would provide increased visualization of the mammillary body boundary landmarks, without loss of the signal intensity–to-noise ratio when compared with the standard 1-mm isotropic MPRAGE volume scans. Previous studies have used scans with section thicknesses ranging from 1.0 to 3.0 mm.27–32 An additional MR imaging sequence was used to acquire intracranial volume data for normalizing the data for differences in head size across patients and controls. This sequence was a T2-weighted intracranial volume scan; parameters were TR, 3000 ms; TE, 102 ms; FA, 150°; 3-mm section thickness; 10-mm section gap; acquisition time, 2 minutes. The FOV of the images was 220 × 220 mm. The mammillary bodies are spheric structures, approximately 5 mm in diameter, located inferiorly in the brain at the posterior limit of the hypothalamus.33,34 They are composed of 2 nuclei (medial and lateral), with the medial mammillary nucleus composing >90% of the volume of the structure.34,35 Demarcation of the medial mammillary nucleus is relatively straightforward by using thin-section MR images, because this nucleus is surrounded by an attenuated fiber capsule (Fig 1). Also, the inferior limit of the mammillary bodies is marked by the CSF signal intensity arising from the interpeduncular fossa, with the lateral landmark being the substantia nigra.35 The location of the much smaller lateral mammillary nucleus, sitting adjacent to the ventral and lateral aspects of the medial nucleus,35 ensures that this part of the structure was included in the volumetric measures, despite the lack of its visualization on MR imaging. The stereologic procedure for measuring the mammillary bodies. A and B, Mammillary body location and detailed structure. C, Placement of the stereologic grid. D, Method of stereologic point counting. The mammillary body volume estimate is contained within the area indicated by the white arrows. Unbiased estimates of the mammillary body and medial temporal volumes were obtained by using the Cavalieri method of modern design stereology combined with point-counting techniques,36–38 with EasyMeasure Software (easymeasure.co.uk), which is freely available. Volume estimation was achieved by sampling a series of equally spaced MR images by means of a random starting position. Each image was randomly overlaid with a square grid (a regular array of test points). The number of points lying within each transect through the structure of interest was recorded (Fig 1). Test-point separation on the grid was 0.234 cm (ie, 3 pixels relating to a 3 × 3 grid size) for all structures measured. Grid size and section interval varied between structures according to the area of the structure of interest. Five to 6 MR imaging sections from the 0.8-mm-volume sequence passed through the mammillary body structure, and points were counted on every section (Fig 1). The points were summated in EasyMeasure software to provide an unbiased volume estimate of the mammillary bodies, which also included the associated coefficient of error. This measure takes into account the error introduced into the measurement procedure by slicing the structure of interest and by point counting. An intrarater study was performed for all brain structures measured. This involved the remeasurement of structures after 4 weeks. Reliability was assessed by using intraclass correlations (ICCs). The intrarater reliability of the estimates for mammillary body volume was considered first to indicate the reproducibility of the volume estimates and to explore quantitative advantages of 0.8-mm-volume scans. Estimates of mammillary body volume were then compared for the 2 subject groups (colloid cyst and healthy control) and for the 2 volume scan types (1.0 mm and 0.8 mm). The frequency and extent of mammillary body shrinkage following surgery for colloid cysts was then explored. Finally, volume correlations of mammillary body, fornix, and medial temporal lobe structures were examined because they may help determine the cause of mammillary body shrinkage. The intrarater reliability study was performed on the 0.8- and 1.0-mm scans in 10 randomly selected patients with colloid cyst and 10 healthy age-matched control subjects. Right and left mammillary body volumes were measured by the rater (C.E.D.). The procedure was then repeated 4 weeks later by using identical stereologic parameters. ICC of the mammillary body volumes for the 0.8-mm scans in the controls provided values of 0.99 (right) and 0.99 (left). In contrast, the corresponding ICC scores for the 1-mm scans were appreciably lower (0.68 right, 0.53 left). Likewise in the patient group, the 0.8-mm scans gave ICCs of 0.99 (both right and left), whereas the 1.0-mm scans produced lower ICC scores (0.91 right, 0.41 left). A level of intrarater reproducibility >0.8 is considered “good.”45 Figure 2 illustrates the difference in resolution between 1.0- and 0.8-mm scans. Comparison of the resolution of the 1 × 1 × 1 mm isotropic volume scan (A) with the 0.8-mm thin-section volume scan (B) in a patient with relatively normal mammillary body volumes. The 2 sections are taken from neighboring sections around the central region of the patient's mammillary bodies and show the higher resolution of the 0.8-mm scan and the resultant benefit for the identification of the mammillary body landmarks. Table 1 presents the absolute right and left mammillary body volume estimates in the 38 patients with colloid cysts and the 20 healthy control subjects for the 0.8- and 1.0-mm-volume scans. The intracranial volume normalized data (Table 2) were calculated by dividing the absolute volume estimate for that structure by the total intracranial volume for each subject to provide a volume ratio. This may be the most valid measure for group comparisons because it controls for variation in cranial size while avoiding the effects of cortical atrophy potentially accompanying hemisphere normalization procedures. Additionally, the patient group was divided up according to the number of SDs below the control mean volume (Table 3), to examine the spread of atrophy within the group. Figure 3 illustrates the spread of intracranial volume-normalized values for the patients and controls. The volume estimates (0.8-mm scans) of the patient and control groups were then compared to determine whether patients with colloid cysts had atrophied mammillary bodies. Distribution of intracranial normalized control and patient mammillary body volumes. Group comparisons (0.8-mm scans) indicated a highly significant reduction in absolute mammillary body volume in the patient group in both right (t56 = 6.63) and left (t56 = 5.58) hemispheres (both, P < .0001) compared with controls. The variance in the patient group, as measured by the SD, was approximately double that of the control group. The intracranial volume normalized data gave exactly the same overall picture as the absolute volumes (both left and right, P < .0001; Fig 3). Comparison of scan types showed that the absolute (Table 1) and the intracranial normalized (Table 2) volume ratios appeared larger in the control group with the 0.8-mm scans than with the 1.0-mm scans. 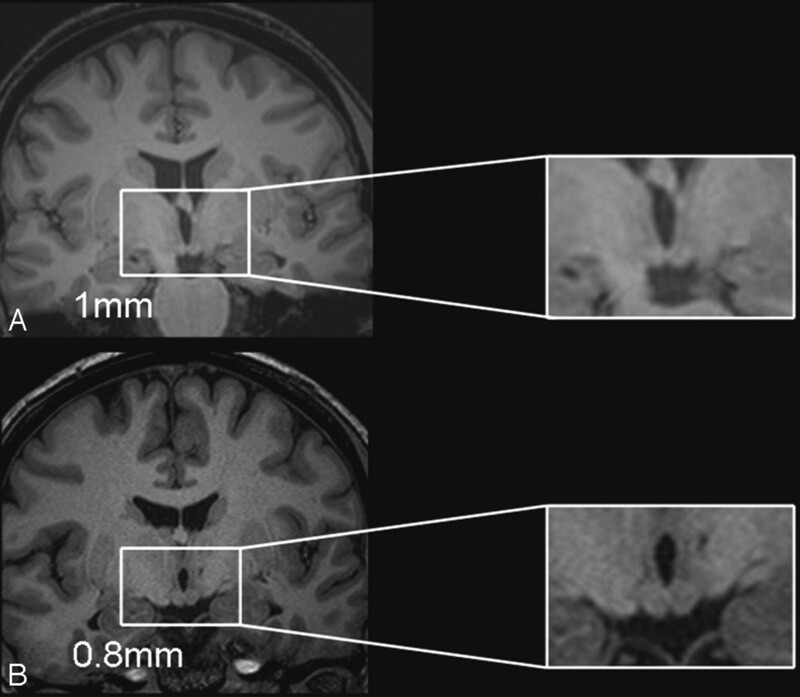 Within-subject comparisons of the volumes derived from the 0.8- and 1.00-mm scans confirmed this difference for both hemispheres (right, t19 = 4.43, P < .001; left, t19 = 3.71, P = .001). However, in the patient group, no significant differences were found (right, t37 = 0.91, P = .37; left, t37 = 1.71, P = .09). Finally, Pearson correlation tests assessed the agreement between the 0.8- and 1.0-mm scan mammillary body volumes in the control and patient groups independently. In controls, volume estimates from the right (r = 0.12, P = .62) and left (r = 0.05, P = .85) hemispheres failed to show a significant correlation. In contrast, volume estimates from the 0.8- and 1.0-mm scans showed significant correlations in the patient group for both the right (r = 0.76, P < .001) and left (r = 0.79, P < .001) mammillary bodies. The finding of a significant correlation for patients, but not controls, presumably reflects much greater volume ranges in the patients, along with a larger sample size. The individual left and right 0.8-mm-scan intracranial normalized mammillary body volumes estimated for the patient group were classified according to z-scores (SD above or below the control mean, n = 20) (Fig 4). Cumulative classification of intracranial normalized patient mammillary body volumes according to the percentage of cases with atrophy below the control mean by using z-scores (1-sample t tests, 1-tailed). Every patient showed both right and left mammillary body volumes that were less than the corresponding mean control values (Fig 3). For 31/38 (right) and 28/38 (left), these volumes were >1 SD below that of the control means. More than 50% of the patients had mammillary body volumes that were significantly smaller than the control means (P < .05, 1-sample t test, 1-tailed; Fig 4). There were no significant correlations between mammillary body volume and time since surgery for the right or left mammillary body (r = −0.229, P = .168; r = −0.278, P = .091, respectively). Four of the 38 patients examined had a postsurgical shunt present. There was a difference between raw volume estimates in the right fornix for patients with shunts (0.24 cm3; SD, 0.14) compared with patients without shunts (0.38 cm3; SD, 0.80). This result was statistically significant (t = 3.43, P = .002). No significant volume change was reported in the left fornix when comparing raw volume in the patients with and without shunts (0.39 cm3; SD, 0.15 and 0.40 cm3; SD, 0.11, respectively; t = 0.20, P = .84). To assess possible causes of the mammillary body atrophy, we calculated correlations between intracranial normalized volumes of the mammillary bodies and of the fornix and various medial temporal lobe structures in the patients with colloid cysts for each hemisphere separately. The volumes of the right and left mammillary bodies were highly significantly correlated with each other (r = 0.65, P < .001). For the right mammillary body, the only other significant correlations were with the smallest cross-sectional area of the right fornix (r = 0.42, P = .008) and the entire right hemisphere volume (r = 0.35, P = .03). For the left mammillary body, the only other significant positive correlations were with the smallest cross-sectional area of the left fornix (r = 0.45, P = .005) and the entire volume of the left fornix (r = 0.47, P = .003). In addition, the left mammillary body volume was negatively correlated with the lateral ventricle volume (r = −0.42, P = .009), and there was a trend for the same relationship on the right (r = −0.30, P = .07). In addition to the decreases in mammillary body volume, patients with colloid cysts showed reductions in the total volume in the right and left fornix (t = 4.67 and t = 4.18, P < .001 for both), though there were no differences between the controls and patients for the smallest cross-sectional fornix area for either right or left hemispheres (t = 1.75, P = .09 and t = 1.11, P = .27, respectively). To establish whether there were significant changes in the integrity of medial temporal lobe structures in the patients with colloid cysts, we compared their intracranial normalized volume ratios with those of controls by using independent t tests (all df56). The patients showed decreased volumes in the right hippocampus (t = 3.10, P = .003), left hippocampus (t = 3.24, P = .002), right and left parahippocampal gyri (t = 2.18, P = .033 and t = 4.37, P < .001), right and left hemispheres (t = 4.80, P < .001 and t = 3.52, P = .001), and right and left entorhinal cortex (t = 3.68, P = .001 and t = 2.82, P = .007, respectively). Although fornix shrinkage was frequent, only 3 patients showed bilateral severance of the tract, with another 2 patients having unilateral severance (1 left, 1 right). All 3 patients with bilateral fornix loss had very atrophic mammillary bodies (mean normalized volume ratios of 0.0050 right, 0.0041 left). However, in the patients having a unilateral severance, only the left-sided patient displayed severe mammillary body asymmetry with intracranial normalized right and left mammillary body volumes of 0.043 and 0.0023, respectively. In the patient with right fornix severance, an asymmetry was not obvious; the intracranial normalized volumes were 0.012 and 0.019, respectively. 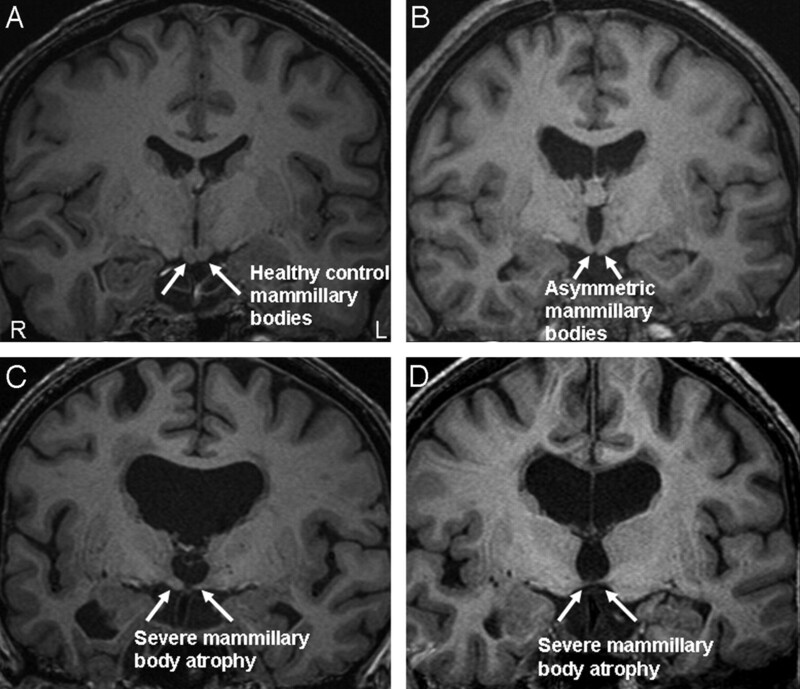 Figure 5 displays the range of mammillary body atrophy found in our patient group. The range of atrophy across our study population. A, Healthy mammillary bodies from a control subject. B, Mild asymmetry in a patient with a colloid cyst. C and D, Severe mammillary body atrophy in the patient group. R indicates right; L, left. The present study shows that mammillary body shrinkage is a very common feature in patients with colloid cysts following surgery and seemingly much more frequent than had previously been occasionally noted. Indeed, more than half of the patients showed abnormally (P < .05) small mammillary bodies, and all patients had smaller intracranial normalized mammillary volumes than the control mean volume. Mammillary body volume correlated with fornix volume, suggesting that a common cause contributes to the atrophy in these structures. In considering these findings, we will first briefly discuss the advantage of the 0.8-mm-volume scan because it directly affects the principal goal of the study. The 0.8-mm volume scan was developed to optimize visualization of the mammillary body landmarks. Although the present study used a 1.0-mm-volume scan for comparison purposes, previous MR imaging studies of the mammillary bodies have used a variety of section thicknesses (1.0 mm,31 1.1 mm,28 1.5 mm,29,30,32, and 3.0 mm26,27). Other differences included the use of a 3T imaging system because previous MR imaging−based measurements of mammillary body volume have used 1.5T systems. The increased resolution with the 0.8-mm scans (Fig 2), as well as the increased section number, should reduce the problem of partial voluming, which limits the accurate delineation of the structure of interest. Consistent with these expectations was the appreciably higher intrarater reliability for the 0.8-mm scan (in patients and controls), with the ICC for the 0.8-mm scans sometimes being twice that of the 1.0-mm series. Furthermore, the control estimates of mammillary body volume were significantly larger for the 0.8-mm scan, presumably reflecting the increased likelihood of sampling the rostral and caudal limits of the structure. The principal goal of this study was to determine the frequency and extent of mammillary body atrophy associated with surgical removal of colloid cysts. A stereologic technique was used to derive mammillary body volume, whereas other studies have used planimetric techniques with patients presenting with cognitive impairment30 and temporal lobe epilepsy.28 Stereology is associated with high levels of reproducibility; and before measurement of the entire cohort, good45 intrarater reliability values of 0.99 for right and left structures, by using the 0.8-mm scans, were obtained, demonstrating that our technique was reproducible, even when applied to patients having significant mammillary body atrophy. Estimates of mammillary body volume from the 0.8-mm-volume scans gave volume means for the control group of 69 mm3 (right) and 67 mm3 (left). These volumes appear comparable with those reported in a number of MR imaging studies using healthy subjects of approximately similar age ranges (eg, 51.7 mm327; 51.4 mm3 28; right, 61 mm3; left, 55 mm3; 67.5 mm332) and from a postmortem study (63.5 mm346). The fact that the volumes in the present study were typically slightly higher than those in these other studies is presumably related to the use of 0.8-mm volume scans, as discussed above. Next, by using intracranial volume normalized data, we found that 82% and 74% of patients with colloid cysts had volume reductions in the right and left mammillary bodies, respectively, of at least 1 SD below the control mean. It is evident that marked mammillary body shrinkage is far more frequent than complete severance of the fornix (unilateral or bilateral). The precise incidence of mammillary body volume loss cannot, however, be determined from this study because 46% of those initially contacted did not have MR images. It is possible that the loss of some subjects introduced a sampling bias (eg, those with the best postoperative status may have been too busy to be scanned and/or those with the greatest cognitive deficits may have had difficulty in responding to the invitation). Even so, the mammillary bodies are very often atrophied in this condition. A subsidiary goal was to explore possible causes of mammillary body shrinkage. Several factors might contribute, including the loss of fornical fibers innervating the mammillary bodies (due to stretching by the tumor or by the surgical approach), damage to the anterior thalamic nuclei resulting in retrograde degeneration in the mammillary bodies, and the direct impact of the cyst or its associated raised intracranial pressure. One informative approach to distinguish between these possibilities would be to compare the status of structures immediately before and after cyst-removal surgery. This approach was not, however, feasible with the current cohort because it was assembled from different centers across the United Kingdom so that the scanning before surgery was very variable and, in many cases, consisted of CT rather than MR imaging. Although the present study relied heavily on correlations, the evidence strongly points to multiple causes of mammillary body atrophy. First, fornix damage remains a very likely candidate. Previous experimental studies have shown that complete unilateral fornix transection in monkeys and radical unilateral hippocampal/subicular loss in a single person both result in an approximately 50% reduction of mammillary body volume.21 The postmortem measurements revealed that the mammillary atrophy was principally due to the loss of neuropil.21 Consistent with the view that fornix fiber loss contributes to the atrophy in patients with colloid cysts, the patients in the present study had reduced fornix volumes39 as well as significant correlations between the smallest fornical cross-sectional area and the degree of mammillary body shrinkage. Whether these effects are due to direct damage to the fornix or the loss of temporal lobe projections cannot be resolved here. Although the lack of significant correlations between mammillary volume and hippocampal or entorhinal cortex volumes support the former view, there was evidence that both the hippocampus and the entorhinal cortex were reduced in volume. Thus, a contribution from temporal lobe pathology cannot be excluded. Only 3 of the 38 patients showed a complete loss of the fornix in both hemispheres. 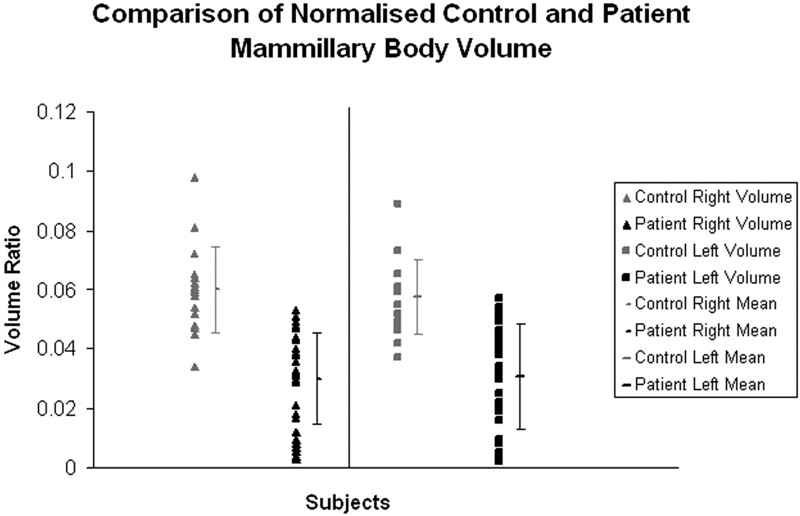 Even so, 14 patients had right mammillary body volumes, and 15 patients had left mammillary body volumes less than half that of the control mean. In some of these patients, the mammillary body volumes were <25% of the control mean (7 left and 8 right). It seems, therefore, unlikely that these more extreme changes could reflect the loss of fornix fibers alone, which would be expected to produce only ≤50% volume reduction.21 The finding of significant, negative correlations with ventricular volume suggests that this factor, either directly or indirectly, also contributes to mammillary atrophy. One potential indirect ventricular effect is via anterior thalamic damage (caused more directly by the cyst). The anterior thalamic nuclei are the principal efferent targets of the mammillary bodies,47 and damage to these nuclei results in gliosis and neuronal death in the mammillary bodies. Thalamic volume was not, however, measured in the present study because this region is made up of numerous nuclei that cannot be reliably distinguished on MR images. Although the present study cannot determine the precise incidence of mammillary body shrinkage in all patients who undergo surgery for colloid cysts, it is evident that this is a common occurrence. Recent evidence pointing to the importance of the mammillary bodies for everyday memory13,48 highlights the need to anticipate memory problems in such patients and to accommodate such problems. The findings also underscore the value of developing surgical treatments that are least likely to disrupt the fornix when removing these tumors. In summary, we found that patients with removal of a colloid cyst from the third ventricle very commonly show mammillary body shrinkage, in addition to previously recognized pathology in other structures, most notably the fornix. These mammillary body changes were not isolated to a few patients; and unlike in other studies, the sample studied here was not selected for known memory problems and was, therefore, not heavily biased. Thin-sectioned MR imaging scans provided more reliable volume estimates, due to the increased visualization of the anatomic landmarks and the increased number of measurements from which the volume estimate was derived. Finally, significant correlations were found between mammillary body volume and fornix volume. 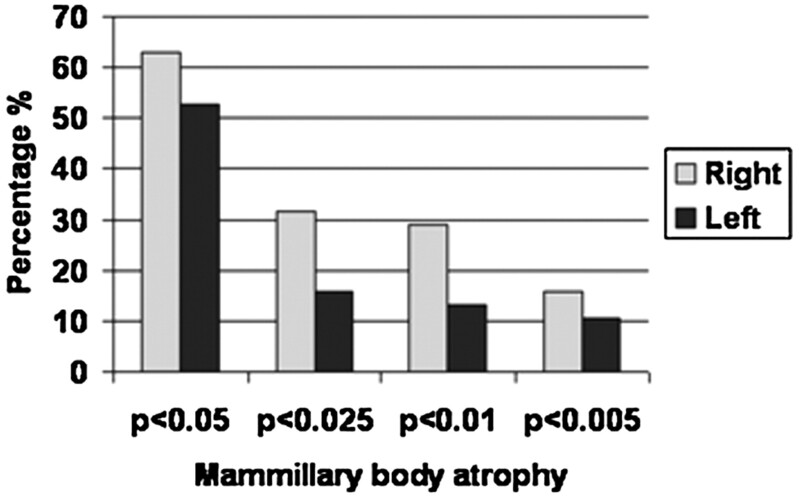 Although these correlations point to a direct relationship between mammillary body volume and its deafferentation, these data do not appear to provide a full explanation of the extent of mammillary body atrophy in all cases. It is, therefore, assumed that other factors, including raised ventricular pressure, in this condition may also impact the mammillary bodies, either directly or indirectly. Our study shows that mammillary body atrophy is a very common feature of this condition and needs to be considered when trying to understand how colloid cysts alter cognition. This work was supported by the Medical Research Council (United Kingdom). Accepted after revision October 26, 2008.